Si el infierno es una casa, la casa de Hades, es natural que un perro al guarde, también es natural que a ese perro lo imaginen atroz. Sacar el cancerbero a la luz del día fue el último de los trabajos de Hércules. Este perro con tres cabezas denota el pasado, el presente y el porvenir, que reciben y, como quien dice, devoran todas las cosas. Que fuera vencido por Hércules prueba que las acciones heroicas son victoriosas sobre el Tiempo y subsisten en la memoria de la Posteridad. Según textos antiguos, el Cancerbero saluda con el rabo, que es una serpiente, a los que entran en el Infierno, y devora a los que procuran salir, una tradición posterior lo hace morder a los que llegan. Para apaciguarlo, era costumbre poner en el ataúd un pastel de miel. If the hell is a house, the house of Hades, it is natural that a dog to the one keeps, it is also natural that to that dog they imagine it atrocious. To take out the cancerbero by the light of the day was the last of Hercules' works. 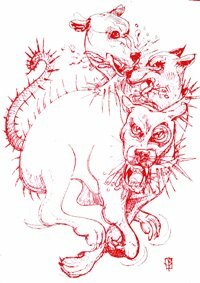 This dog with three heads denotes the past, the present and the future that you/they receive and, so to speak, they devour all the things. That it was conquered by Hercules it proves that the heroic actions are victorious about the Time and they subsist in the memory of the Posterity. According to old texts, the Cancerbero greets with the tail that is a snake, to those that enter in the Hell, and it devours those that try to leave, a later tradition he/she makes it bite those that arrive. To appease it, it was habit to put in the casket a cake of honey.